The last poster batch for Killing Them Softly seemed like overkill, but the flux of alternate posters for the film from The Assassination of Jesse James by the Coward Robert Ford is likely an effort to make up for the mediocre first poster. Now, on this Election Day (get out there and vote if you haven't all ready) the red, white and blue motif from the other posters seems all the more appropriate, and it's been called upon again with this final alternate poster from the film's official Facebook page. 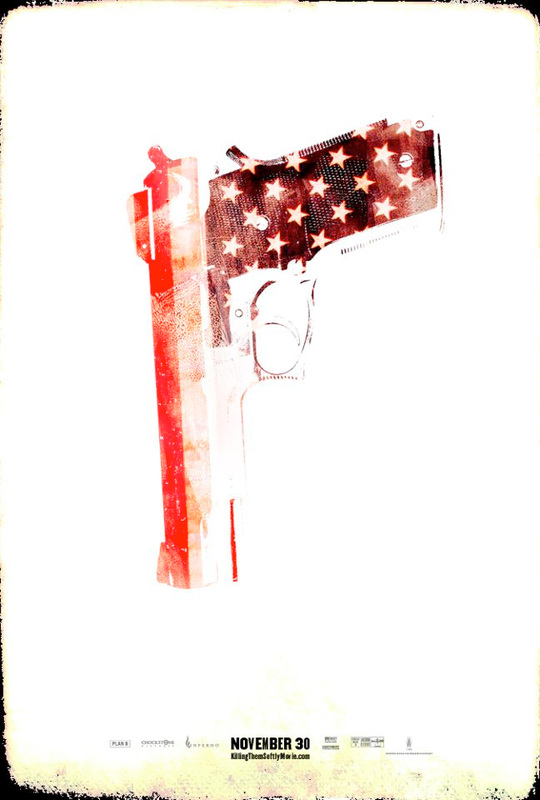 While some might call it patriotic, the old stars and stripes making the outline of a gun does have a message, but you have to see the film for that. Killing Them Softly, based on George V. Higgins' crime novel Cogan's Trade, follows Jackie Cogan (Brad Pitt), an enforcer who investigates a heist that takes place during a high stakes poker game perpetrated by two junkies played by Scoot McNairy (Monsters) and Ben Mendelsohn (Animal Kingdom). Andrew Dominik (Chopper, Assassination of Jesse James) both writes & directs the film which also features Casey Affleck, Sam Rockwell, Richard Jenkins (Let Me In), Ray Liotta (GoodFellas) and more. This first premiered at the Cannes Film Festival and The Weinstein Co. will be releasing it starting November 30th this fall. You in? Sam Rockwell isn't in this film. Sam Shepherd is. so the poster count is now up to 147?